On Thursday the Unicode Consortium — of which Apple is a part — announced the 179 candidates that are on the shortlist for emoji in Unicode 12, which should reach iPhones and other mobile devices in the first quarter of 2019. 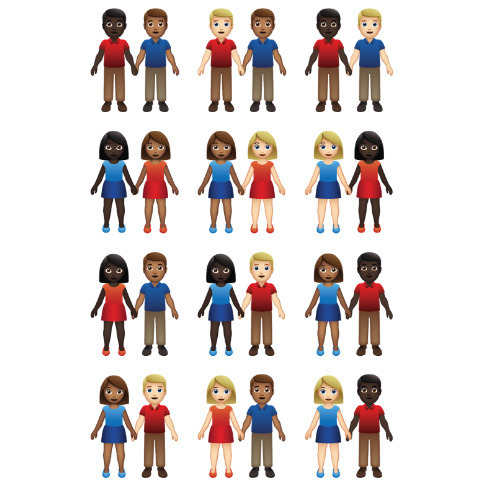 In a recent meeting of the Unicode Technical Committee, the Consortium added a candidate emoji for a deaf person, and a full 55 variations of a couple holding hands. The large number of combinations accommodates different genders, skin tones, and sexual orientations. A service animal vest has meanwhile been changed to a safety vest, but may be attached to a service dog emoji. The shortlist will be finalized at the next Technical Committee meeting in September. The Consortium is already laying the groundwork for 2020, in fact adding eight more "provisional" candidate emoji for consideration, namely a ninja, military helmet, mammoth, feather, dodo, magic wand, carpentry saw and screwdriver. More candidates will be collected through March 2019, at which point recommendations for draft candidates will begin. Unicode 11 should arrive on Apple platforms later this year. iOS, macOS, and watchOS will gain over 70 new emoji, presumably alongside the introduction of iOS 12, macOS Mojave, and watchOS 5.